A dialogue between the coloured, gaudy caribbean carnival and the black-and-white venetian one is the basis from which the workshop moves. 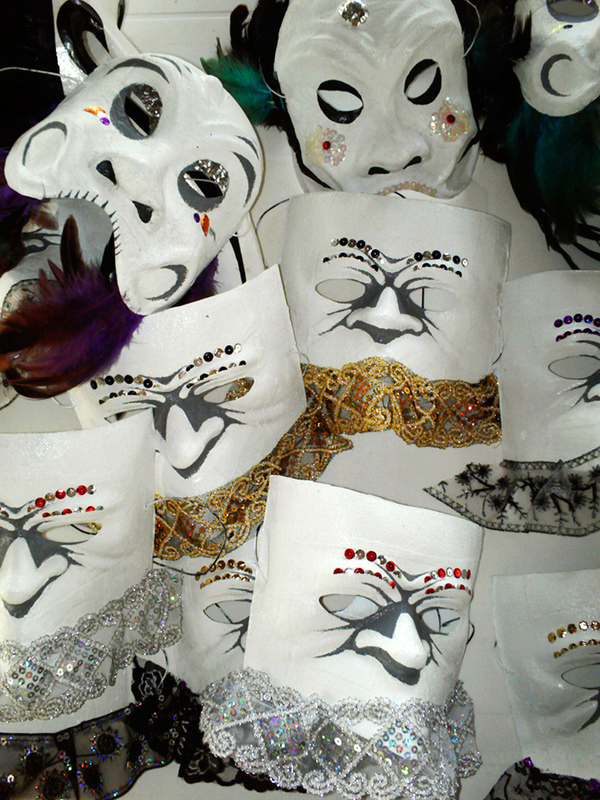 In a few days, by using the same materials that colombian people employ to embody their flamboyant, carnivalesque pantheon, the artist realised her own, hybrid version of some important italian masks like Arlecchino, Zanni, Bautta and Plague’s Doctor. A re-definition of the traditional meaning of these masks gives inspiration to the performance, involving colombian young boys and girls in a two days workshop and the final show. On the scenary of a contemporary worldwide crisis, social and economical status are criteria we are induced to assume evaluating our own life. Those parametres, like a Plague Doctor, would establish if our existence is healthy and if we deserve to live inside the golden city walls. Or like a master of puppets, pulling the strings of our life through induced desires and ambitions.